Almost every major organization maintains an online community for its customers, employees, and partners. To be successful, these communities require enormous resources (people, money, content, tools, members, etc.). But does a community help a company make money? Does it help drive marketing and other business objectives? How do successful communities thrive and drive results for their sponsors without losing their ethos of openness, audience-relevant content, and “marketing-free zones”? 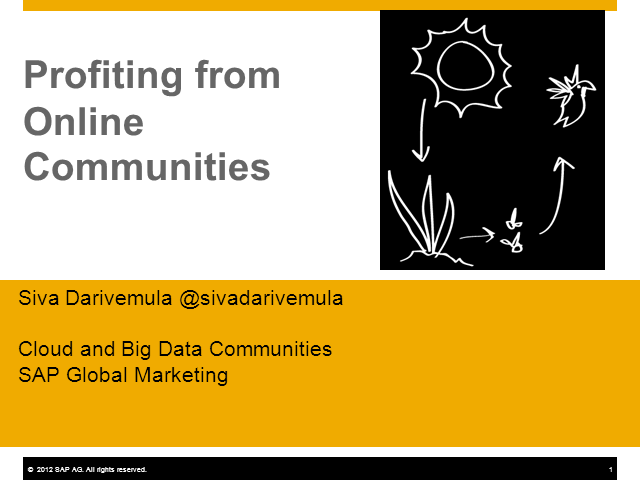 Attend this webinar to hear how SAP built a community of over 2.5 million members and is able to support its marketing and business objectives without compromising the value and relevance of the community for its members. We will discuss the strategy, planning, and provide examples of driving demand through community as a classic case of “pull” marketing. Title: Are Online Communities Profitable?